Efficient BRT systems have elevated boarding platforms, and low-floor buses, which allows much easier disabled access (without assistance from the operator) and also facilitates very fast boarding of many people simultaneously, usually through 2 or even 3 different doors. You can do this because everyone’s already paid for their ticket on the platform. This same separation of the platform and the right-of-way makes it more difficult for passengers to access the front of the bus (where we might put a couple of bike racks), especially if we were to use a semi-enclosed platform design. The fact that the buses have low floors means there’s no cargo space underneath. Will using BRT necessarily mean decreasing bike capacity on transit in the US 36 corridor? I’ve noted before that bikes-on-transit isn’t a multi-modal model that scales up very gracefully, and because of this you don’t find much of it in the places that have really normalized bikes as transportation. The large amount of bike capacity on the regional RTD buses is actually pretty unusual, and it’s something that doesn’t get a lot of love from RTD, because the below-deck bike capacity requires the operator to intervene, which impacts their on-time performance. This might or might not be another strike against bikes-on-BRT, depending on how short the headways (intervals between buses) are. Once you get to less than 10 minutes or so between buses, people stop looking at schedules altogether (think of the Skip along Broadway), which would mean impacting the schedule to deal with bikes might not be such a big deal. It would still impact trip time though, and that’s one of the major advantages of the BRT system — with a dedicated right-of-way and very efficient pre-paid, multi-door boarding, the estimated travel time between Boulder and Denver is something like 25 minutes. We’re not the first ones to come across this issue of course. Both Eugene, Oregon and Everett, Washington have BRT lines, and they’ve decided to provide bike capacity inside the bus itself, as shown in these videos. It’s along the lines of bikes-on-lightrail, which shouldn’t be too surprising, since BRT really operates like light rail, except that it’s got rubber tires. 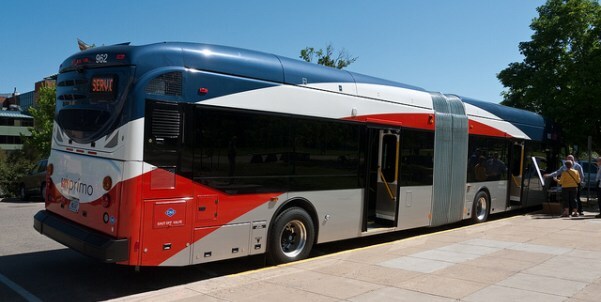 The Santa Clara Valley transit authority is looking at adding bike-on-bus capacity too. All those options are more like 2-3 bikes per bus, not a dozen. Hopefully with the increased service frequency the overall bike capacity per day wouldn’t be significantly impacted, and the consequences of finding that the bus was full would be much milder than it is today. With buses every 10-15 minutes, waiting for the next one wouldn’t be so terrible. This week a BRT bus stopped by Boulder and Denver as it was on its way to San Antonio, TX for delivery and I got a few pictures, below. This isn’t the particular design that we’d be looking at — RTD procurement of dedicated BRT buses is a long way off — the visit was meant more to try and familiarize people with the BRT concept. It’s telling though that this bus has exactly zero bike capacity. This is definitely an issue we should talk about before we get anywhere near buying the buses themselves. Cross posted from Flat Iron Bike. The Train, the Bus, or Both? Thank you for bringing this issue up Zane! It would be tragic if we proceeded all the way towards implementing BRT, but simultaneously discouraged cycling as a means of transit. The last mile is a real issue when it comes to getting commuters to their final destination. It is essential our public transit system doesn’t make cycling seem burdensome. For many commuters, it is already easy enough to come up with justifications for not getting on their bike but instead take a single occupancy vehicle. I hope the future of BRT and RTD in the Denver-metro area will consider getting bikes and people around the region a priority. Great article Zane!